Prepare for the rotation exams with the first exam prep resource to cover all of the most commonly tested rotations! Presented in a full-color, concise format, this must-have new book covers high-yield content from each of the major PA rotations: Internal Medicine, Family Medicine, Pediatrics, OB/GYN, Surgery, Emergency Medicine, and Psychiatry. Featuring 25 practice questions, with an additional 25 available online, for each rotation, this practical solution offers you everything you need for rotation exam success. 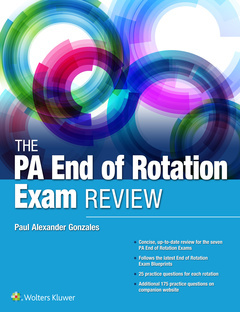 Excellent value: All major PA rotations are covered in a single text. Concise: The tabular and outline format is ideal for quick exam study. High-yield: Information and questions are geared toward each rotation exam and cover high-yield topics, ensuring strong preparation. Easy to use: Overlapping content between rotations is fully cross-referenced and easy to locate, regardless of your current rotation. Full color: High-quality artwork and photos provide must-know visual information, including dermatology images. Online resources: Practice tests—including 25 questions per rotation that are not in the book - provide additional practice and review.